Apple Pay launched in the UK in mid-July this year with eight banks on board supporting the contactless payments service – and it looks like Lloyds, who was previously absent from that list, will soon join that list. If you head into the Apple Pay app and try to add in a Lloyds Bank card, you can now make it all the way to the terms and conditions page. Before when you tried to add in a card you were just greeted with a message that said, "Your Issuer Does Not Yet Offer Support For This Card". 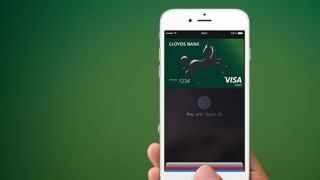 Techradar reached out to a Lloyds spokesperson who gave us the lacklustre statement, "Lloyds Bank will be launching Apple Pay in the autumn." We're now officially in autumn, and it needs to launch soon as customers are becoming more and more frustrated that they're being left out from the new way to pay. When Lloyds does launch, it'll leave the only major UK bank missing from the Apple Pay support list as Barclays, which is insistent on offering its own contactless payment system but is also "really excited" to launch Apple Pay.